A systematic review revealed that to reduce the risk of carious pulp exposure, partial caries removal (indirect pulp therapy [IPT]) can result in long-term success compared with complete caries removal in the deep lesion. A clinical trial demonstrated high survival rate of permanent teeth when deep carious lesions were managed without exposing the pulp by placing an indirect pulp cap. These results demonstrated that the teeth pulps remained symptomless and maintained their healing potential and defensive capacity after treatment. Elimination of the bulk of the infected dentin and sealing the remaining carious lesion from oral fluids with appropriate materials is an accepted treatment for badly decayed teeth. In addition, performance of IPT is simpler/more economical than RCT. The following report discusses the first case of successful management of a symptomatic permanent tooth with irreversible pulpitis and associated apical periodontitis using IPT with CEM, followed by a sandwich glass-ionomer composite restoration. A 12-year-old female with a symptomatic first left lower molar was observed at a private clinic. She complained of severe lingering pain to cold lasting for few minutes. She also complained of spontaneous pain during the day and at night time. Review of the patient's medical history revealed no significant findings. Extraoral evaluation revealed normal soft tissue structures with no apparent pathosis. Intraoral examination showed a first left lower molar with a large carious lesion. Diagnostic tests were performed; the involved tooth responded with mild pain to percussion and severe lingering pain to Endo-Frost cold spray (Roeko; Coltene Whaledent, Langenau, Germany). 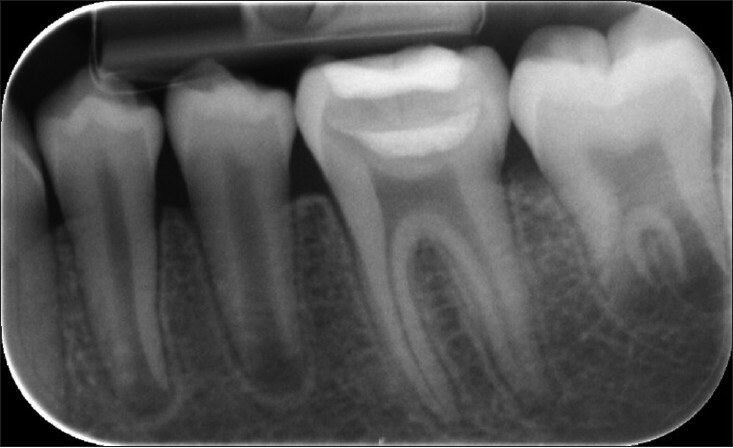 Radiographic examination showed a large carious lesion associated with apical periodontitis [Figure 1]. The adjacent/opposing teeth were asymptomatic and responded normally to all diagnostic tests. Based on the clinical and radiographic examinations, the diagnosis of irreversible pulpitis with apical periodontitis was made. Thereafter, IPT of the tooth was decided; an informed consent was obtained from the patient's legal guardian. The patient was instructed to rinse her mouth with 0.2% chlorhexidine. The tooth was anesthetized with 2% lidocaine with 1:80,000 epinephrine (DarouPakhsh, Tehran, Iran) and then isolated with rubber dam. Subsequently the dentin-enamel junction was completely excavated. The bulk of soft carious dentin was carefully removed by tungsten-carbide round burs (Komet, Lemgo, Germany) at low speed; medium and large spoon excavators (Ash, London, UK) were also used. Excavation was terminated once the remaining carious dentin showed increased resistance to manual instrumentation. After that, the remaining carious dentin in pulpal floor was covered by ≈1.5 mm layer of CEM cement (BioniqueDent, Tehran, Iran). The remaining tooth cavity was then restored/sealed with glass-ionomer cement and composite resin sandwich technique [Figure 2]. The patient was re-examined clinically after 1 and 7 days. At the 1-day follow-up the patient complained of sensitivity to cold which had significantly decreased 1 week post-operatively. Tenderness to percussion was not reported in both follow-ups. Patient was recalled at 1 year for clinical/radiographic follow-up. Clinical examination with cold test showed a vital tooth which was functional, asymptomatic, with normal physiologic mobility, normal probing depths, and a satisfactory coronal restoration. Radiographic examinations showed normal periodontium, and evidence of periapical healing [Figure 3] and [Figure 4]. The final diagnosis was normal pulp with normal PDL. This study conducted IPT with CEM cement for a pulp with sign/symptoms of irreversible pulpits along with apical periodontitis. 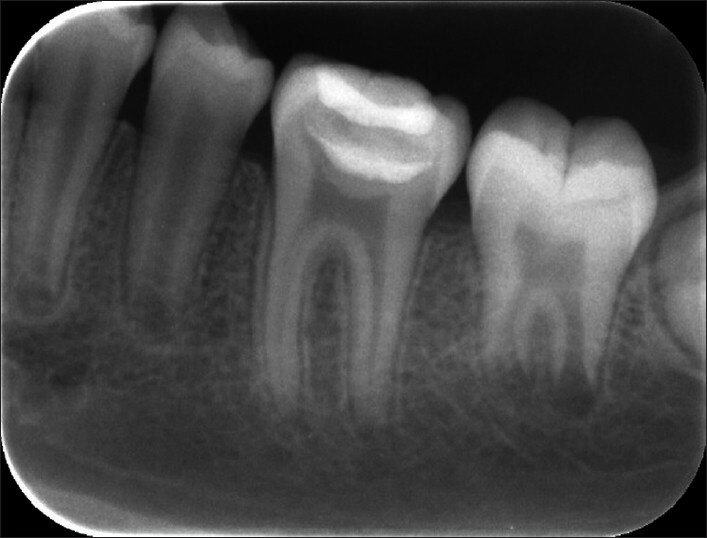 Though, apical periodontitis seemed evident on the radiograph, the pulp was still vital. The general consensus in cases where irreversibly inflamed pulp has been diagnosed, is that the pulp no longer has the potential to heal and will not survive with any form of treatment. However, it should be considered that irreversible pulpitis is a clinical term for the classification of pulpal diseases; when treating the deep carious lesion clinicians have to diagnose irreversible pulpitis on the basis of indirect diagnostic methods. There is little evidence to correlate the clinical signs/symptoms with histological feature of the diseased pulp. Therefore, dentists are trained to diagnose irreversible pulpitis when patient complains of pain lasting for a few minutes to several hours, pain exacerbating with hot/cold fluids, and radiating pain;  as well as tender to percussion. However, there is no information to indicate which symptom is an indication that the pulp no longer can repair itself. Conversely, recent reports have demonstrated that teeth with irreversible pulpitis showed favorable treatment outcomes with pulpotomy using CEM/MTA as pulp cappings. ,,, Though the diseased pulps in these cases were inflamed, they were still vital; that is they still maintained a blood supply and therefore the most important factor for healing. In the light of recent high-level evidences,  the inflammatory process should be re-examined to recognize its possible or probable positive effect on pulpal healing. Our clinical/radiographic follow-ups also showed favorable treatment outcomes for IPT/CEM. These results reveal that severe local inflammation in pulpal tissue may heal and be repaired if the irritant is removed and the pulp is well protected from further irritants. If further studies support this, there may be a need for reclassification of dental pulp diseases. The concept of complete caries removal is currently being challenged for permanent teeth. A growing body of evidence has demonstrated that IPT is successful for the management of deep caries lesion in primary molars as well as two-stage technique in immature permanent teeth; however, some recent studies have shown similar results in mature permanent teeth. IPT reduces the risk of carious pulp exposure, diminishes the substrate for microorganisms, prevents lesion development and promotes a physiological reaction in the pulp-dentin complex. Several studies have demonstrated that once cariogenic bacteria are isolated from their nutritional supply by an adequate coronal seal, they either perish or become inactive. Furthermore, once a seal is applied to carious dentin, it becomes dry/hard, arresting the carious process after IPT with a one-visit method. Accordingly, the second appointment may not be needed, if the coronal restoration preserves the seal of cavity. Our 1-year clinical follow-up showed that the one-visit IPT coronal filling was satisfactory, and therefore a second appointment was not scheduled. The favorable results in this case study may be partly attributed to the patient's age. A young patient's tooth may have slightly open apices and the dental pulp may respond more positively to pulp capping than a mature pulp. 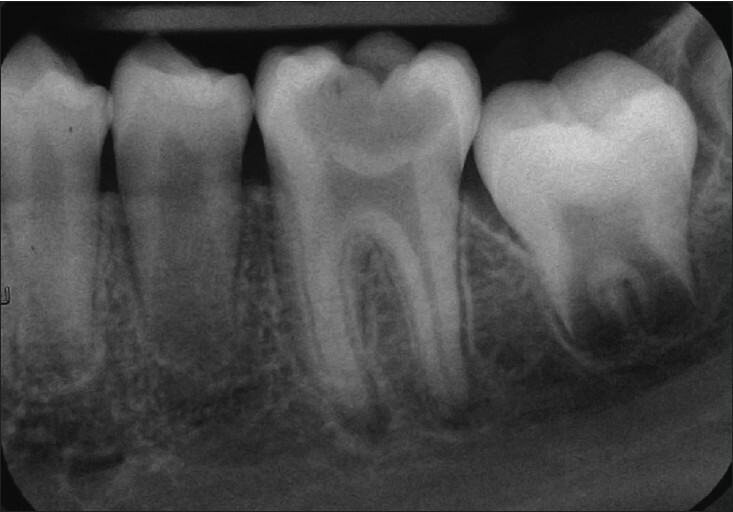 Based on our clinical and radiographic observations, we can conclude that despite apparent pulpal and periradicular inflammation from the deep caries lesion, a conservative IPT can generate pulpal repair and periradicular healing in a mature permanent molar tooth. In addition, IPT/CEM of deep caries lesion in young patients is an easier, more practical and valuable treatment plan than complete caries removal which may result in pulp exposure and root canal treatment. However, well-conducted clinical trials on this proposed technique will be required for more grounding clinical evidence. 1. Levin LG, Law AS, Holland GR, Abbott PV, Roda RS. Identify and define all diagnostic terms for pulpal health and disease states. J Endod 2009;35:1645-57. 2. Seltzer S, Bender IB, Ziontz M. The dynamics of pulp inflammation: Correlations between diagnostic data and actual histologic findings in the pulp. Oral Surg Oral Med Oral Pathol 1963;16:846-71. 3. Eghbal MJ, Asgary S, Baglue RA, Parirokh M, Ghoddusi J. MTA pulpotomy of human permanent molars with irreversible pulpitis. Aust Endod J 2009;35:4-8. 4. Asgary S, Ehsani S. Permanent molar pulpotomy with a new endodontic cement: A case series. J Conserv Dent 2009;12:31-6. 5. Asgary S. Calcium-enriched mixture pulpotomy of a human permanent molar with irreversible pulpitis and condensing apical periodontitis. J Conserv Dent 2011;14:90-3. 6. Nosrat A, Seifi A, Asgary S. Pulpotomy in caries-exposed immature permanent molars using calcium-enriched mixture cement or mineral trioxide aggregate: A randomized clinical trial. Int J Paediatr Dent 2012. 7. Asgary S, Eghbal MJ. Treatment outcomes of pulpotomy in permanent molars with irreversible pulpitis using biomaterials: A multi-center randomized controlled trial. Acta Odontol Scand 2012. 8. Ricketts DN, Kidd EA, Innes N, Clarkson J. Complete or ultraconservative removal of decayed tissue in unfilled teeth. Cochrane Database Syst Rev 2006;3:CD003808. 9. Bjørndal L, Thylstrup A. A practice-based study on stepwise excavation of deep carious lesions in permanent teeth: A 1-year follow-up study. Community Dent Oral Epidemiol 1998;26:122-8. 10. Stark MM, Nicholson RJ, Soelberg KB. Direct and indirect pulp capping. Dent Clin North Am 1976;20:341-9. 12. Asgary S, Eghbal MJ, Parirokh M, Ghoddusi J. Effect of two storage solutions on surface topography of two root-end fillings. Aust Endod J 2009;35:147-52. 13. Asgary S, Kamrani FA. Antibacterial effects of five different root canal sealing materials. J Oral Sci 2008;50:469-74. 14. Asgary S, Eghbal MJ, Ehsani S. Periradicular regeneration after endodontic surgery with calcium-enriched mixture cement in dogs. J Endod 2010;36:837-41. 15. Asgary S, Eghbal MJ, Parirokh M, Ghanavati F, Rahimi H. A comparative study of histologic response to different pulp capping materials and a novel endodontic cement. Oral Surg Oral Med Oral Pathol Oral Radiol Endod 2008;106:609-14. 16. Malekafzali B, Shekarchi F, Asgary S. Treatment outcomes of pulpotomy in primary molars using two endodontic biomaterials. A 2-year randomised clinical trial. Eur J Paediatr Dent 2011;12:189-93. 17. Nosrat A, Asgary S. Apexogenesis treatment with a new endodontic cement: A case report. J Endod 2010;36:912-4. 18. Nosrat A, Asgary S, Eghbal MJ, Ghoddusi J, Bayat-Movahed S. Calcium-enriched mixture cement as artificial apical barrier: A case series. J Conserv Dent 2011;14:427-31. 19. Samiee M, Eghbal MJ, Parirokh M, Abbas FM, Asgary S. Repair of furcal perforation using a new endodontic cement. Clin Oral Investig 2010;14:653-8. 20. Asgary S, Nosrat A, Seifi A. Management of inflammatory external root resorption by using calcium-enriched mixture cement: A case report. J Endod 2011;37:411-3. 21. Nosrat A, Seifi A, Asgary S. Regenerative endodontic treatment (revascularization) for necrotic immature permanent molars: A review and report of two cases with a new biomaterial. J Endod 2011;37:562-7. 22. Asgary S, Nosrat A, Homayounfar N. Periapical Healing After Direct Pulp Capping With Calcium-Enriched Mixture Cement: A Case Report. Oper Dent 2012;37:571-5..
23. Goldberg M, Farges JC, Lacerda-Pinheiro S, Six N, Jegat N, Decup F, et al. Inflammatory and immunological aspects of dental pulp repair. Pharmacol Res 2008;58:137-47. 24. Thompson V, Craig RG, Curro FA, Green WS, Ship JA. Treatment of deep carious lesions by complete excavation or partial removal: A critical review. J Am Dent Assoc 2008;139:705-12. 25. Maltz M, de Oliveira EF, Fontanella V, Bianchi R. A clinical, microbiologic, and radiographic study of deep caries lesions after incomplete caries removal. Quintessence Int 2002;33:151-9. Asgary, S. and Ahmadyar, M.
ghoddusi, j. and forghani, m. and parisay, i.